Tonight was a playtest run of “Dragonknights”, a game in the works by Travis Scott. Mentor: The finer points of diplomacy diplomacy ends at a dragon’s snout. Everyone knows that Steward Oldfa is the true power in the domain. She whispers in the ears of the rules, pulls the strings of the local Trade Leagues, and even has a few Magistrates she can rely on to get things done or covered up. Steward Oldfa came to power through financial dominance over other stewards, in particular by placing tremendous pressure on Magistrate Ardolf the Angry. Every traveler takes one of three major trade roads in your domain. The Burning Pass is known for its scalding winds. The Gentle Road is known for its bandits. The Merchant’s Trail is known for its kudzu-like carnivorous grass. The confluence of several major trade routes falls at the outskirts of your domain. The beloved Ogre’s Head Ale is in great supply, and the contraband Root Death (made from yolk of Venomous Whisper Drake eggs) is put up with by the good fold of the domain. Uncertain Futures > Opportunities & Endeavors > Who Would Rule? The dominant faction in the local Stewards Council has been ousted, and the people couldn’t be happier! Steward Parduelf has been given the new title of Speaker. He is speaks of progress but is an insidious demagogue. His first major change was to remove the regulations regarding Root Death usage. What luck! Vast plains support a huge quantity of cattle. Goodman Wufric makes sure that Fort Hope gets its share, though he is cross with Fort Hope because they snubbed Magistrate Ardolf the Angry’s diplomatic envoy. Steward Olfda - the power behind it all. Magistrate Adrolf the Angry - ousted from power. Steward Pardeulf - an insidious demagogue, and puppet of Steward Olfda. Smith Wufric - provides cattle for Fort Hope. Scholar Parewan - Bandit leader, gave Domnus Oric the gift of a letter of introduction to the Melted Library. Domnus Oric reverse engineered a safe for him. Domnus Grimaer orchestrated the safe of Magistrate Ardolf falling into the hands of Parewan. Recently branded a bandit. Domnus Angwyn, Warrior - A dragon bonded warrior of Fort Hope. The Land of Vos - Blades are forged in the blood of the fallen, in a way creating a family tree. This blade begat this blade. Taking a cue from Travis’s GenCon game, I gave each bonded pair a moment in each of the dragon’s lairs. We are also pressed for time, having about 2 1⁄2 hours to play. Coathios has a small table set for tea. He is enjoying tea with Ilfwan his prized porcelain doll. Oric enters through the fine crafted door. The lair is shelves of lesser dolls each facing the large soft bed on which Coathios rests. Skollis has his lair arranged such that morning sun shines in. The polished arms and armor reflects and magnifies the morning sun. 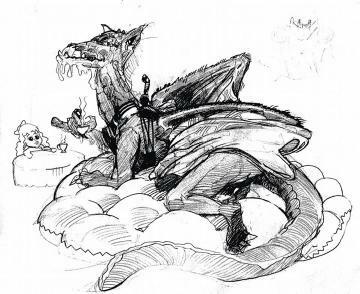 Bowid has asked Oric and Grimaer to prepare their dragons for flight. It turns out that Bandit Parewan has stolen a book that will prove Magistrate Ardolf‘s treason. But they must act in haste for Magistrate Ardolf will be leaving the lands in 6 days time. And this capture should happen within Fort Hope’s domain! They take flight to gather information from the city of Iyravandron. Domnus Oric reaches out to Smith Pulfric learning the general whereabouts of Parewan (Contacts, Create an Advantage Obstacle 4, Success). Two days have passed, but Skollis is confident in getting the scent. After two days of heavy flight, I compelled Coathios’ delicate Lustrous Nightfang frame to drive him and his rider to ground. Coathios accepted the the compel. Note: in hindsight, reading through the Lustrous Nightfang is not frail and easy to tire. Skollis and Grimaer continued on. In flight I called for a Notice check on Skollis and Grimaer, though encouraged a bit of a retroactive Create an Aspect. Grimaer encourage Grimaer to keep the _sun at their backs _(Lore, Create an Advantage, Obstacle 3, Success with Style). Skollis notices a single ballista and three men (Notice, Overcome, Obstacle 3, Success). There are also grazing sheep nearby, not a distraction for this well-fed and rested brazen bolter. Skollis and Grimaer remain unnoticed proceed to fly around to gain an ambush (Stealth, Overcome, Obstacle 4, Success). A quick ambush ensues. Skollis destroys a ballista, kills a human, injures a second, and captures a third. A gentle interrogation proceeds, with words of honor exchanged, and the captive released. Parewan is in fact in a cave nearby with 20 men. While Coathios and Oric were waiting, Oric crafted some leather wing enhancements (Craft, Create an Advantage, Obstacle 3, Success with Style) to help. They agreed to wait until an hour or so before dawn to strike Parewan. So Coathios and Oric took to the air and scouted high in the night sky. They were real quiet (Stealth, Overcome, Obstacle 3, Success with Style) and were waiting. Coathios’s player opted to spend a Fate point to have Parewan step out to relieve himself. Sounded great by me. Coathios struck fast subduing and dragging off Parewan. Back at their camp Coathios, Oric, Skollis, and Grimaer began bargaining with Parewan. Grimaer, on his honor, promised that if Parewan surrendered himself and the book (a new book written in ancient Indarin) that all of Parewan’s men would be free to disperse. Parewan accepted the terms. They flew back to the camp where Parewan explained the situation. One by one he said farewall to each man and woman by name, also naming their spouses and children. We closed the session with a mission accomplished. In game, four days have passed since Bowid gave the assignment. It has been a long time since I ran a Fate game, but I was willing to fake an awful lot of things. There are a few things I need to lookup. The game that I ran felt as though it belonged in the world of the previous games of Dragonknight I’ve played. In part this is because I’ve had the privilege to play four sessions with the creator of the game. But the richness of the setting generator helps fold the common themes back in upon themselves. And sweet heavens do I love the detail of honor. I made sure to emphasize that the absence of the empathy skill and the value of honor mean that when you say “On my honor” people will believe you. It is a big thing. There are too many nuances of the setting for me to have “digested” and gotten right. Conveying the spirit of the campaign world is a challenge. I did not put the “So you’re a Magistrate” paper in front of the magistrate player, so there me be a deviation from canon, but I feel like we have enough moving parts to set things in motion. I have more thoughts but the hour draws late. Dragonknights - Session #1 by Jeremy Friesen is licensed under a Creative Commons Attribution-NonCommercial-NoDerivatives 4.0 International License. Based on a work at https://takeonrules.com/2014/08/30/dragonknights-session-1/. Permissions beyond the scope of this license may be available at https://takeonrules.com/more_permissions/.